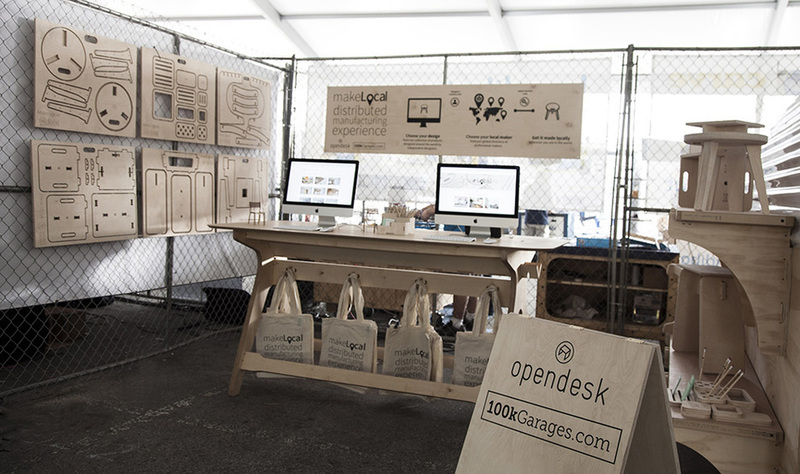 Opendesk were invited to take part in the New York World Maker Faire last weekend - and had a great time! Here we talk about the distributed manufacturing experience we set up, in collaboration with 100k Garages. Maker Faires always have a unique buzz about them. Those hosted in the US come with the typical American hype and energy that epitomises the maker movement across the nation. 10, had brought a scooter to the faire with his family. Fixed to his scooter was a skateboard deck, merging the two to form a skate-scooter if you will. The boy had done something which he identified had made him part of something. It was this simple gesture and act of sharing that typifies the eagerness of American’s to be tagged “makers”. It is this unique attitude that makes world Maker Faires in the US different. It was at the same Faire that an exciting conversation was started. Bill Young, creator of 100kGarages and ShopBot’s Special Projects Lead, was a man I had heard a lot about. A popular and inventive figure in the realm of distributed manufacturing. It was here where the seeds for the “Make Local” distributed manufacturing experience were sewn. An idea that started as little more than a short conversation between Bill and I at a busy Maker Faire, developed across the Atlantic before being realised in New York. 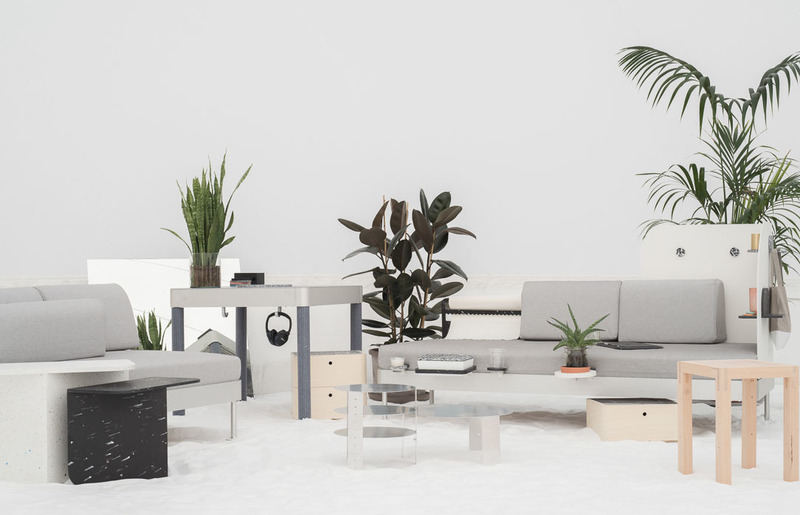 The idea started with a selection of principles that we felt defined the ambitions of Opendesk and 100kGarages, but also the distributed manufacturing movement as a whole. Designs and designers have value. This new manufacturing model brings with it new routes to market and new ways for designers to make money and gain exposure through platforms like Opendesk. The open source movement intimidates many designers, as they confuse the term with the word “free”. It is crucial that a distinction is made between the two. A product can be open source but, under the creative commons licensing system the author can still receive fees and credit. A real alternative to mass manufacturing and viable way of getting things made under a new transaction model. Customers witness the provenance of their products like never before, socially connecting with all the parties involved in the production of their chosen product - maker and designer. Around these principles we began to create an experience that would illustrate the bigger picture of our respective companies, playing them out on a smaller “bite-size” scale at the Faire. 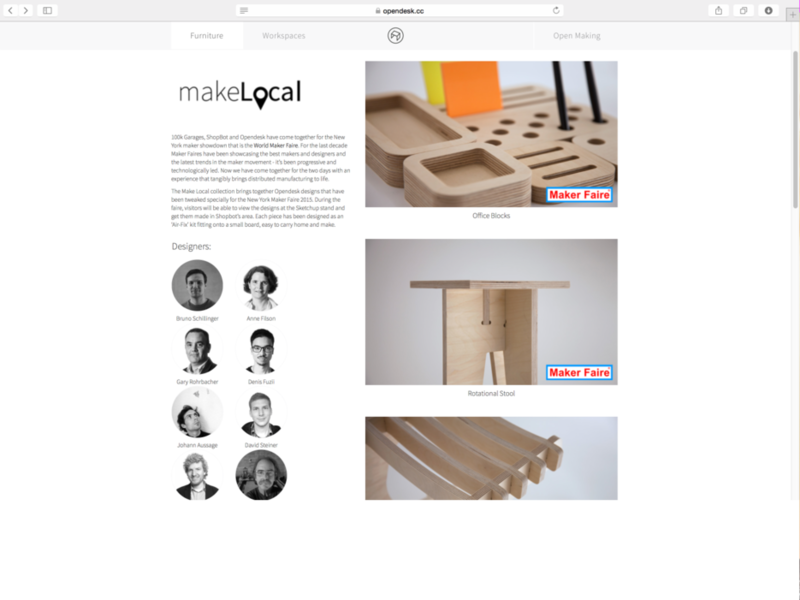 The result was “Make Local” a distributed manufacturing experience, a theme title that bound our two companies in collaboration. 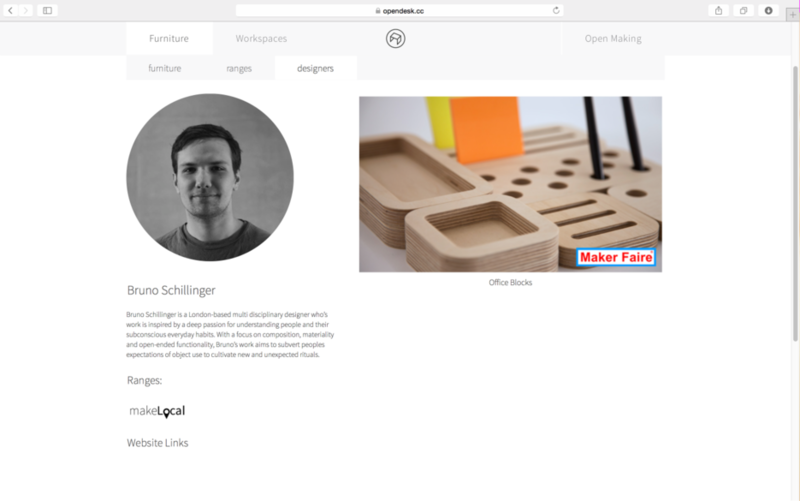 Visitors were first introduced to the Opendesk web-platform, where they could browse a collection of products, designed around the world. A unique, limited edition collection could also be viewed through its contributing designers in the Make Local range. These limited edition designs could be bought and made at the Faire in front of their soon-to-be owners. Fees collected would be used to cover the cost of machining with a large percentage of 20% also going to the designers of the products. The unique experience of getting products made locally at the Faire was only for the lucky few to have attended. However, anyone, anywhere in the world could access the manufacturing files for each design through opendesk.cc and use the maker locater to find a fabricator near them to produce the design. So whilst the tangible experience existed at the faire, the narrative extended beyond, through the unique sharing culture of our platform. Bill and I were sceptical about the number of designs we would actually sell. How many visitors really come to a Faire looking to buy CNC milled wooden furniture? That being said, the experience was so vivid and enjoyable that some 40 designs from the Make Local range were sold to around 100 visitors. 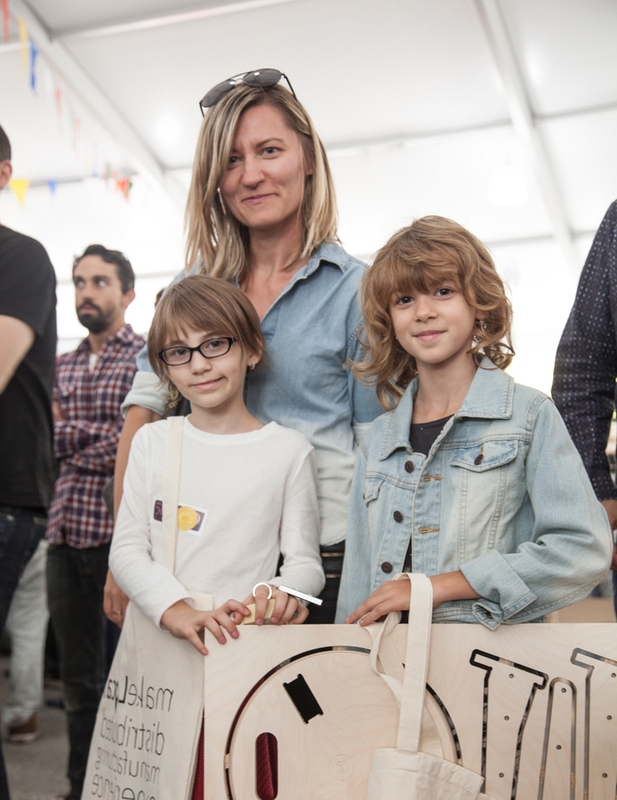 Many visitors had not heard of distributed manufacturing or Opendesk, but were so captivated by the experience that they wanted to take a piece of it home. The gratifying process of learning about each product was a step each visitor took time to investigate. Much time was spent examining the roots of a design and the reason for its conception. The unique story behind each designer added narrative and value to the product. 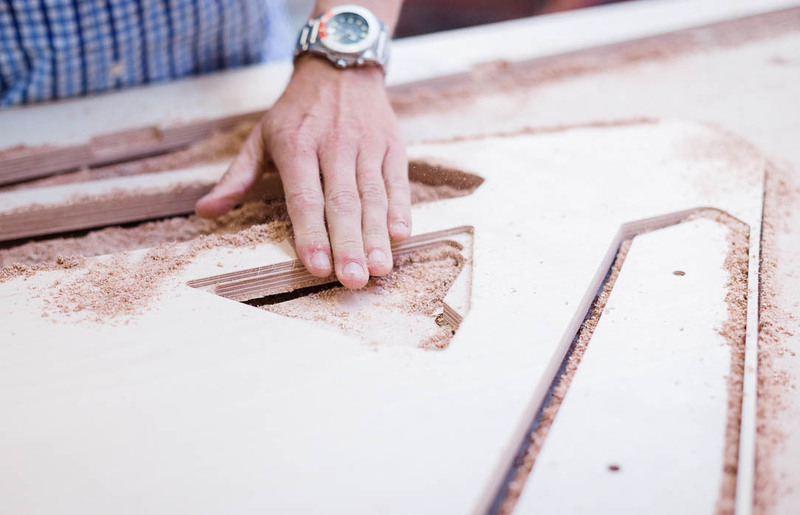 A 100kGarages fabrication hut containing a ShopBot CNC revealed the making element of the experience. Chosen designs could be made locally at the Faire, right in front of the purchasing visitor. This element brought the experience to life, permitting visitors to see the way a product had been made - and the ease and accessibility of transacting under a new model. We met representatives from nonprofits, maker spaces and educational bodies who regularly use Opendesk. Many who didn’t who hadn’t wanted to implement its use in the future, visioning opportunities the platform presents for vocational practices. Families with young children found the concept entertaining and the small furniture items on offer were perfectly suited for young ones. The Edie stool, appropriately named after the young girl it was designed for, was particularly popular! “Make Local” distributed manufacturing experience is a work in progress and we look forward to running a second iteration at the San Francisco World Maker Faire in 2016. See you then! 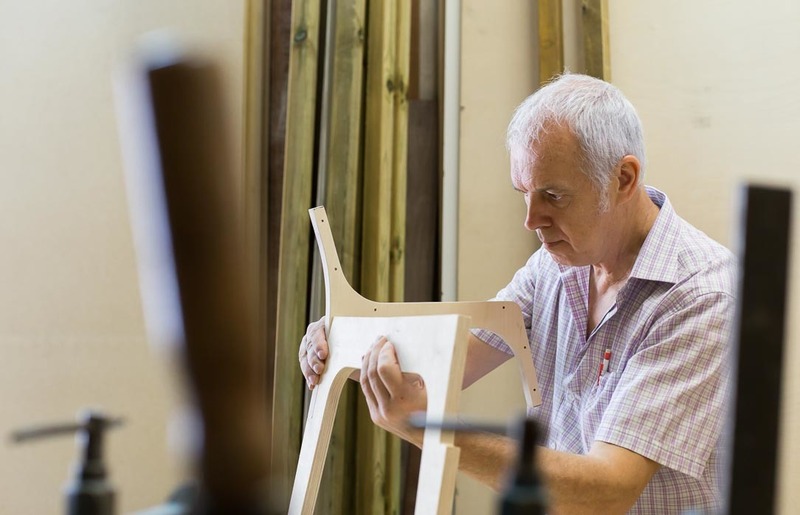 From woodworking in Barcelona to recovery from the 2008 financial crisis. 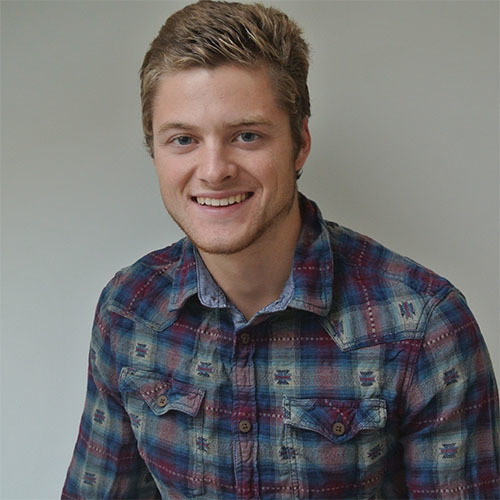 Read Sergi’s story of resurrection. Mass production meets hyper-local fabrication via 7 designers experimenting with recycled materials.